Splinter hemorrhages are small areas of bleeding under fingernails or toenails that take the shape of straight lines and may be caused by damage to the vessels. Splinter hemorrhages are tiny bleeding points in the nail bed and hyponychium of the nail unit. The nail bed is the skin under the nail, which begins where the moon (lunula) ends and the nail plate just begins to lift up from the skin underneath. At this point, there is a small, extremely narrow area that is slightly pink in color, which represents the hyponychium. Because of the anatomic structure of the nail bed (where it is arranged in longitudinal grooves and ridges), when there is a small amount of bleeding within one of these grooves, it is trapped by the overlying nail plate. 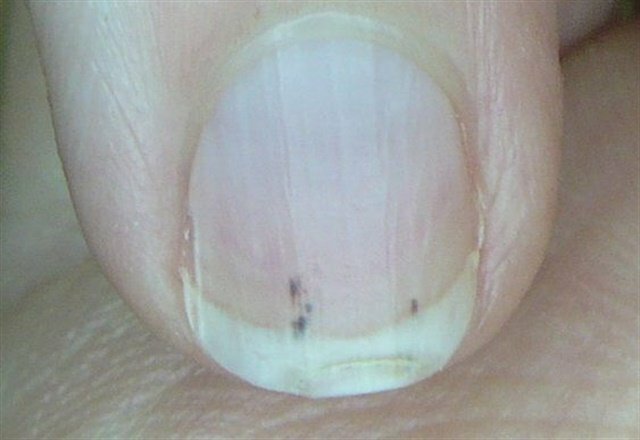 Since the nail bed itself is linear in its construction, it assumes a straight line appearance and actually looks like a tiny splinter underneath the nail, hence the name splinter hemorrhage. In the overwhelming majority of cases, splinter hemorrhages are not due to any serious underlying systemic disorder or any skin disorder of the nail unit for that matter. Therefore in most situations, as the nail grows out, since the splinter hemorrhage is deposited on the under-surface of the nail plate, it will grow out with the nail and the nail bed over a period of time and consequently disappear completely, usually in a period of a few months. The most common cause of splinter hemorrhages is simple trauma or minor injury to a finger or toe, which results in minute amount of bleeding underneath the nail plate. There are other occasions, however, in which the splinter hemorrhage may be a sign of some abnormality. For example, even a fungus infection of the nail (onychomycosis) may give rise to small splinter hemorrhages in the nail bed. Another common condition that may cause splinter hemorrhages of the nail bed is nail psoriasis. In this condition, there is a thinning of the upper layer of the nail bed (epidermis) and therefore the small blood vessels are not as deep down within the tissue of the nail bed, so splinter hemorrhages are easier to develop. Therefore they occur frequently in patients who have nail psoriasis. Certain medications — including simple aspirin — may also predispose an individual to develop splinter hemorrhages. Obviously when the fungus infection is treated with topical and/or systemic antifungal agents and the infection resolves, the splinter hemorrhages will not only disappear but will also no longer continue to occur. The same is true with the nail psoriasis, which is usually treated with some form of cortisone, usually in the form of a cream or solution and sometimes, in more severe cases with cortisone injections around the nail unit. Certain medications may also predispose an individual to develop splinter hemorrhages of the nail bed. One of the most common of these is simple aspirin, which slows the coagulation process of the blood and therefore may lead to splinter hemorrhages. It is analogous to the bruises that some patients get when they take aspirin in high dosages or on frequent occasions. One might say that it is like a bruise of the nail bed itself. Other medications in a similar fashion that are very commonly used are the so-called non-steroidal anti-inflammatory agents (NSAIDS), which are sold over-the-counter for headaches, arthritis, and other types of minor pains. When splinter hemorrhages occur in larger numbers, that is on many nails, it may be a sign of a systemic disorder. In addition to occurring in larger numbers in these situations, they also occur with much greater frequency and in more locations. In this situation they may be a sign of a connective tissue disorder, such as lupus or scleroderma, which are serious and do require medical evaluation and treatment. Splinter hemorrhage may also be seen in individuals who have Raynaud’s disease. Raynaud’s disease is that condition of the finger and toes where they are oversensitive to cold and may be seen in the wintertime with discomfort after exposure to cold, such as when skiing. At the same time that the splinter hemorrhages occur, there may also be pink, blue, or white discoloration of the tips of these digits. This, too, would require medical evaluation for possible treatment. In most patients who have Raynaud’s disease, it is not associated with any serious underlying systemic disorder but on occasion it, too can be a manifestation of a connective tissue condition such as lupus and/or scleroderma. The only way to get rid of a splinter hemorrhage is to simply let it grow out. Analogous to the Raynaud’s phenomenon are those individuals who are mountain climbers and climb at very high altitudes where the hemoglobin level in the blood is raised. This also can give rise to splinter hemorrhages. Therefore, these individuals must always wear a heavy protective layer of gloves to protect them from the cold of the high altitude on the mountains. On rare occasions, patient who have disease of the heart valves (endocarditis) may develop many splinter hemorrhages of the nail beds. These patients, however, are seriously ill with high fever, anemia, and heart murmurs. Thus it would be expected that such individuals would already be under the care of a physician. When the splinter hemorrhages are a result of medication, such as aspirin, then treatment simply consists of discontinuing the medication if this is possible in regard to an individual’s general health status. More serious diseases, of course, will require medical evaluation and treatment. Even diabetics on occasion get splinter hemorrhages of the nail beds, which could be a manifestation of the diabetes requiring more strict control with either diet and/or insulin. Splinter hemorrhages that persist over an extended period of time would require a medical evaluation including laboratory work to rule out the possibility of an underlying blood disorder. One example of this would be overactive thyroid disease (known as thyrotoxicosis). This condition could give rise to splinter hemorrhages. Treatment would consist of treating the thyroid gland and then the symptom of splinter hemorrhages would no longer occur. Click here to read about subungual hematoma, an accumulation of blood under the nail plate resulting from trauma to the fingers or toes. ManiGlovz offers a glove that acts as a UPF 50+ UV protective sunblock. For clients who are concerned about UV and LED light, the gloves can be used when their hands are in the lamp.